Today I just had one movie to see at 2:30. I decided to read nothing about the movie, and just in error, maybe, wore an Irish knit cardigan to keep warm. 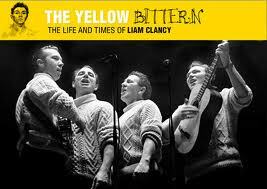 A part of this movie, a documentary on The Clancy Brothers and Tommy Makemthe centres around the stage attire, Irish white fisherman's knit sweaters as well as The Clancy's and Tommy's wonderful relaxed stage presents, and Irish Folk ballads from the rich history of that Isle. Director Alan Gilsenan films an almost empty soundstage with Liam Clancy, on a stool, guitar on his lap, talking about his life. The story starts at his childhood and takes us on his trip from a small village in County Tipperary, Ireland to the heights of fame in America, and Ireland. Listening to Liam speak was like sitting at a party listening to the most interesting person talk, with a wonderful soundtrack, the Clancy Brothers with Tommy Makemthe playing on the stereo. The footage of the brothers on stage is from different eras. One very interesting interview was Bob Dylan from about 1962 speaking of how, their ballads influenced him. However there is a dark choky under taste to this movie, it builds and for me it is what I have taken home. There was more to tell and more voices to hear, but that is for another movie. STAY at the end after to credits to hear Liam recite The Yellow Bittern. I think it is important enough to print it here. This poem is a translation of the 18th-century poem translated by Thomas MacDonagh. You'll get no sup when your life is past. And a dram won't stop our thirst this night.